The Vocation Cross is available for any and all parishioners interested in praying for an increase in religious vocations. To reserve the cross for one week, please sign the sheet at the entrance of the church. Would you pray for a priest each day? 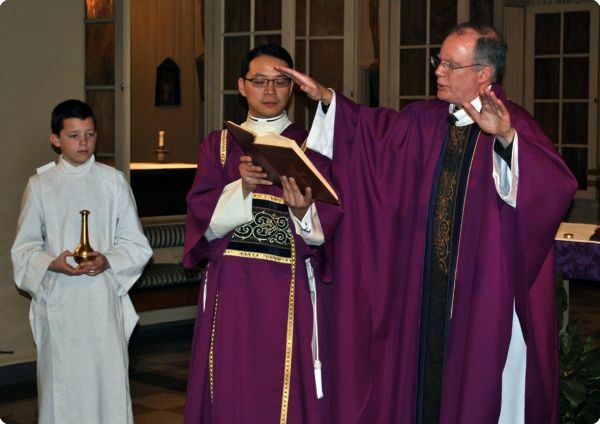 The Monthly Prayer Request for Priests (MPRP) is an international apostolate which was founded in 1990 to encourage people to support Catholic priests by prayer and sacrifice. Each diocese prays for its own priests. Each day of the year bears the name of a priest from that diocese, obtained from the diocesan directory. Thus, by means of a calendar, the faithful are united in offering prayer and sacrifice for the particular "priest of the day", always remembering to included a general intention of prayer for all priests of the diocese and around the world. The MPRP calendars for the Archdiocese of Boston are available in the entrances of the church and chapel. Won't you join in praying for a priest a day?